type of New York exchange labels. Those of us who are involved in the collection and study of late 19th and early 20th century United States postal history are well aware of the special labels used by the U.S. Post Office Department to clearly distinguish and account for pieces of international registered mail during this period. The production and use of these labels resulted from the implementation of an 1882 Universal Postal Union resolution requiring that international registered mail matter bear a label or impression of a stamp with a capital letter R in Roman text. The USPOD opted for gummed labels which, for the most part, were produced through the joint efforts of the Government Printing Office (printing) and the Bureau of Engraving and Printing (gumming, perforating, and distributing). The use of these labels by those post offices authorized to handle inbound and outbound foreign registered mail became effective on January 1, 1883 and stayed in effect, virtually unchanged, until January 24, 1911. Such postal facilities were designated “exchange offices” and the labels have thus come to be known as “exchange labels.” Figure 1 shows a partial sheet of the most common type of these labels, the New York exchange label. More recently, The Collectors Club Philatelist, the house organ of the Collectors Club of New York, published a two part article by noted collector, author, and exhibitor Alfred L. Kugel. 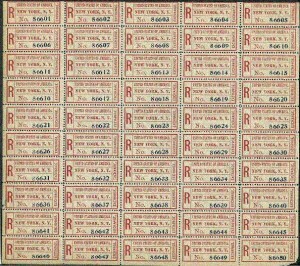 The stated intent of Mr. Kugel in writing these articles which appeared in the September/October and November/December 2000 issues was not to deal with matters covered by previous researchers but rather to update the philatelic body of knowledge as to the number of covers bearing examples of these labels from the post offices authorized to use them. Based upon reviews of his own collections, auction catalogues, and the viewing of noteworthy registry exhibits such as those of Bostwick, Green, and Landau, he constructed a census of covers bearing labels from each of the individual exchange offices. According to his research, registry exchange labels were either authorized and/or used from thirty-four offices. However, no examples are known to exist from nine of these. Of the twenty-five offices from which covers are known, the number of examples range from several thousand of the common New York exchange type to one each from Key West, San Antonio, Douglas, and Tampa. The remaining locations are, for the most part, each responsible for fewer than a dozen examples. Since its publication, “The Kugel Census”, as it has come to be known, has been widely quoted in the philatelic press, in dealer’s advertisements, and in auction catalogues when attempting to convey the relative scarcity of a particular cover and thereby, has become a factor in establishing the value of the item. The Schuyler Rumsey auction held in December, 2002 contained a specialized registry collection broken down into eighty-three lots, many of which were covers bearing U.S. registry labels from a number of the “scarcer” exchange offices. The Kugel Census data was added to the description of each such offering. Shortly thereafter, the Matthew Bennett auction held in New York on February 5, 2003, included a seventeen lot section entitled “United States Registered Labels on Foreign Mail.” Again, the Kugel Census data was included in the appropriate lot descriptions. Unfortunately, discussions of the numbers extant of the scarcer labels are handicapped by the fact that some (perhaps many) examples are likely held by non-label collectors, who view them as merely attractive additions to covers that were acquired for other reasons. Therefore, they are unlikely to show up in any survey of labels unless spotted by happenstance by a label enthusiast in an exhibit somewhere. Thus there may be a lot more of the things out there than we think, but try to find them! And finding them is no easy task when one realizes that they may be lurking anywhere. Consider, for example, the cover in Figure 2. 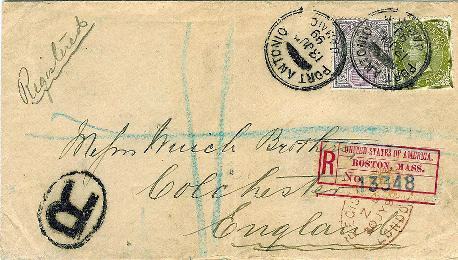 This piece of registered mail originated in Jamaica and was delivered to the addressee in England. During the course of its travels from Jamaica to England, it was handled by the U.S. postal system and, in accordance with postal regulations, received a Boston registry label when it departed the United States. The problem is that this cover is franked with Jamaican stamps and delivered to a country other than the United States. It is, therefore, quite possible that an auction catalogue would list it in a section of Jamaican material and a dealer may place it in a box of English postal history. Figure 2: Boston registry label on cover from Jamaica to England, 1899. Considering how long these labels were actually in use, it is noteworthy how many new discoveries have continued to turn up (or at least have more recently come to the attention of registry label collectors). Perhaps this is why the study of this subject is so fascinating. For this reason, no essay on labels can be considered as providing “the last word”, since something new is sure to come along in due course. There may be a few covers that were counted twice as no attempt was made to compare pictures from catalogues or from dealers with those in the above collections. On the other hand the total amount is probably undercounted because U.S. Registry labels were sometimes put on the back of envelopes and in some cases we only had photographs or photocopies of the front of the cover. As this is the first survey of registered covers from Panama with U.S. Registry labels attached we believe that many more exist. there is no way of eliminating any duplication in the studies since the particulars of the individual covers are not noted. Secondly, even though the Zemer article was published in 2001, the lot describers at both the Rumsey and Bennett auction houses more than a year later utilized the lower count of Mobile labels reported in the earlier Kugel Census when noting the scarcity factor of covers bearing such labels. Please note that the author is in no way implying any attempt by either house to deceive potential bidders. In fact, I have done business with both firms and have found them to be beyond reproach. Rather, I believe that the use of the earlier Kugel Census data was the result of either not knowing of the existence of the Zemer study or a greater confidence in the findings of the Kugel Census. In either case, this situation vividly demonstrates the need for a more organized and systemic approach to the study of these U.S. registry exchange labels. Such a course of action is dictated for two reasons – one academic and one economic. On the academic level, our hobby has probably had more research conducted and published on its subject matter than any other. The availability and accuracy of this body of knowledge has enabled all of us to enjoy our avocation much more than we would have been able to otherwise. It is, therefore, incumbent upon us to continuously strive to compile as complete and accurate a record as possible of all the various aspects of philately. The economic reason is equally as compelling. Many factors combine to establish the value of a particular piece of postal history. Things such as rates, routes, frankings, and markings play an important part. The addition of a “scarce” registry label can turn an ordinary run of the mill cover into a highly desirable item. However, “scarce” is a relative term and can only be determined based upon an accurate record of what, in fact, exists. For these reasons, the author began to explore the possibility that the Society establish a Registry Label Study Group which would expand upon the work of Mr. Kugel and Mr. Zemer and also provide an ongoing venue for the reporting of new discoveries. The USSS seemed the logical organization to undertake such an endeavor. With more than 1700 members, the volume of material in our collective hands is immense and would certainly yield new finds. Our monthly journal, The United States Specialist, is the ideal vehicle for the dissemination of our research findings. Indeed, it is our publication which is one of the first to be consulted by members, researchers, auction houses, and dealers when a question regarding any aspect of United States philately needs to be answered. It is also the journal which published Barbara Mueller’s series of research articles regarding these labels in 1972 and 1973. During discussions with others interested in the study of these labels, it became apparent that in addition to the exchange labels, there are other aspects of the registry system which would benefit from organized ongoing study such as the domestic label/receipt form introduced in 1907 and, of course, the ten cent registry stamp of 1911 (Sc. F1). A number of members of the United States Philatelic Classics Society also expressed the desire to better define the U.S. registry universe and suggested that a combined effort by both organizations had the potential to produce the best possible results. A proposal was made that registry study groups be established within each society and that they share the results of their research efforts. It was also suggested that all articles resulting from the work of the groups be published jointly in the journals of both societies thus reaching the widest possible audience and, thereby, encouraging the combined membership to contribute new information. At our recent annual meeting at CHICAGOPEX, the author presented a proposal for the creation of a Registered Mail Study Group as well as the nomination of Eliot A. Landau to serve as it’s Chairman. In addition to holding membership in both societies, Mr. Landau has been studying and researching not only the label adhesives but also the U.S. registry system in general for more than a decade. Under his leadership the study group will likely produce research results which will have significant academic and economic impact. The proposal was endorsed by the Board and a companion proposal will be introduced to the board of the Classics Society. The mandate of the Registered Mail Study Group is to collect, organize, and disseminate information related to all aspects of the U.S. registry system to include, but not be limited to, labels, stamps, markings, and regulations. Thus far a number of registry students, including Alfred Kugel, have expressed their desire to join the group and work towards achieving the stated objectives. Those of you who have an interest in this area and would like to be a part of this exciting new endeavor are strongly encouraged to contact Mr. Landau by writing to him at Landau & Associates, P.C., 515 Ogden Avenue, Suite 101, Downers Grove, IL 60515 or by email. In addition to being able to make a contribution to philately and the USSS, you will also discover a new way in which to enjoy your chosen hobby. • Barbara R. Mueller, “U.S. Registry Labels – A Preliminary Study,” The American Philatelist, Vol. 68, No. 1 (October, 1954), pp. 21-25. • Barbara R. Mueller, “United States Registry Labels – Their Postal and Philatelic Significance,” 23rd American Philatelic Congress Book, 1957, pp. 65-80. • Barbara R. Mueller, “U.S. Registry Labels – A Study of Types and Usages,” The United States Specialist, Vol. 43, No. 10 (October, 1972), pp 469-472; Vol. 43, No. 12 (December, 1972), pp. 567-569; Vol. 44, No. 1 (January, 1973), pp. 41-43; Vol. 44, No. 4 (April, 1973), pp. 172-173; Vol. 44, No. 6 (June, 1973), pp. 274-275; Vol. 44, No. 8 (August, 1973), pp. 370-373; Vol. 44, No. 10 (October, 1973), pp. 490-496. • Alfred F. Kugel, “Update on U.S. Registry Labels for International Mail,” The Collectors Club Philatelist, Vol. 79, No. 5 (September/October, 2000), pp. 277-280; Vol. 79, No. 6 (November/December, 2000), pp. 295-298. • David Zemer, “U.S. Registry Labels On Mail From Panama,” Copacarta, Vol. 19, No. 1 (September, 2001), pp. 8-9.